Mr. Kampon Tansacha, director of the Nong Nooch Tropical Botanical Garden, is a happy man. Since always, his family has held the monopoly of the distribution in Thailand of the foreign movies, and with its revenues, in 1954, the father, Pisit Tansacha and the mother, Nongnooch Tansacha purchased about 600 acres of land in the province of Chonbur, not far away from Pattaya. Initially, the mother had done of it orchard, with mango trees, extents of pineapples, oranges and other local edible plants, but she was a lover of flowers and was fascinated by the gardens she had seen while travelling abroad. Driven also by the enthusiasm of the son, Kampon, she decided therefore to create a tropical garden and entrust him its management. Kampon, aware of the economical problems of many botanical gardens, thought that, in addition to accumulate all the exotic plants he might find in the surroundings, it was necessary to furnish it of tourist attractions. When, in 1980, the garden was opened to the public, it was quite different from the present one, but there was already a restaurant and an elephant show. About one hundred persons were working there and the aim was to create a pleasant holiday destination. Mr. Kampon was not an expert of plants, but he had seen the English gardens and was fascinated by that of Versailles, in France where topiary was much developed. Unluckily, the box and the bay laurel and other plants used in Europe for this purpose, could not grow up in the Thai tropical climate and furthermore, his property was too flat for creating landscape perspectives. He found effective help in a passionate European, Mr. Anders J. Lindstrom, who moved, more than 20 years ago, to Thailand thus becoming his tireless right arm. When he came there were only 300 workers, and now they are almost 1800! The first thing to be done was the containment of water which was pouring down, during the rains, from the hills back of the property. In many zones of the park nothing could be planted, because the water was carried away everything, and then, paradoxically, the same was missing for the cultivations, as the soil, due to the closeness to the sea, was very sandy and was unable to keep it. The solution to these problems came from a first big drainage channel and from the stones, some huge rocks Mr. Kampon did buy everywhere in order to consolidate the banks and to create two small lakes which, in addition to beautify the landscape, are still now a water reserve essential for the plants. With the reclaimed land from the excavation of the reservoirs, consolidated by rocks and grass, some raised zones were formed, with small buildings, in Thai style, from which it was possible to enjoy the scenery. The most important creation was the copy of the French garden of Versailles. 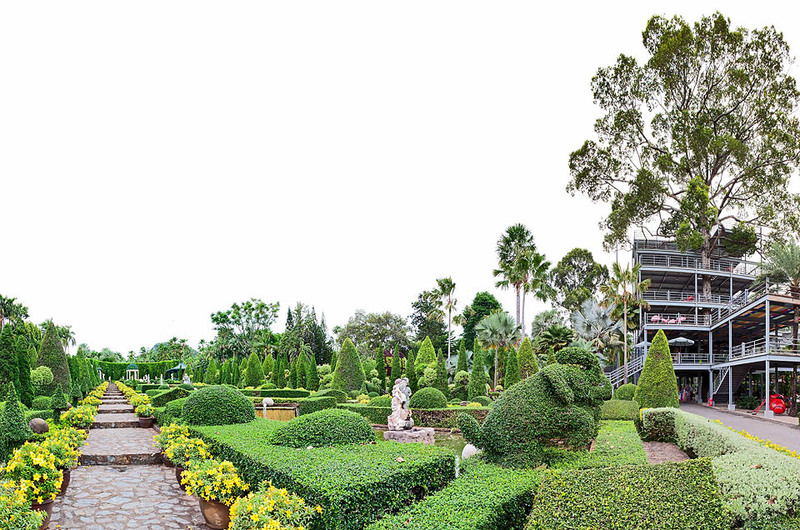 As plants suitable for topiary, were found various species of Ficus and of Streblus, in particular the Streblus asper, and the Wrightia religiosa, a much cultivated species in Thailand, which exists also with variegated leaves. And it was good for the low cut also a shrub with spectacular red or yellow flowers, the Ixora coccinea. In another agricultural property, north to Bangkok, of Mrs. Nongnooch Tansacha, were discovered, while digging, some odd square stones. They did not know what to do with them, but they were immediately carried to Nong Nooch, where they remained, stored, for years, till when, in 1999 the idea came to rebuild, by superimposing them, the structure of Stonehenge. But, above all, Anders’ work consisted in travelling the world looking for new plants. In addition to orchids, much appreciated by the tourists, Kampon was mainly interested to the palms and the Cycadaceae. 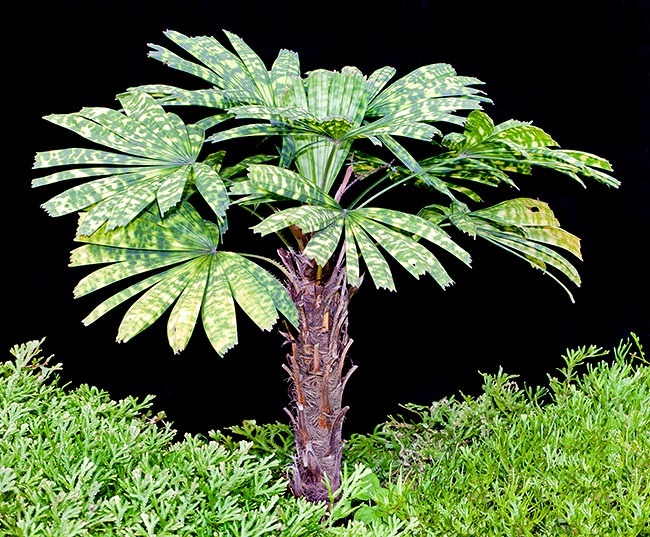 Nowadays, the garden counts more than 8.000 species of palms, with about one million of specimens, among which also the famous Lodoicea maldivica of Seychelles and almost all existing cycads. Anders tells me that in 2011, in order to collect and classify the plants, he has been in Philippines, in Malaysia, Mexico, Honduras, Netherlands, France and England, and that, in the recent past and more than once, he has spent in Nong Nooch less than 30 days per year. Exchanges with various botanical gardens are very active, but excepting the Hoya and the orchids, mostly come from Holland, usually, we give more plants than those we receive. The garden is like an immense open air greenhouse, and whilst the European botanical gardens can afford only two or three specimens of the most cumbersome tropical species, here the same are counted by dozens. 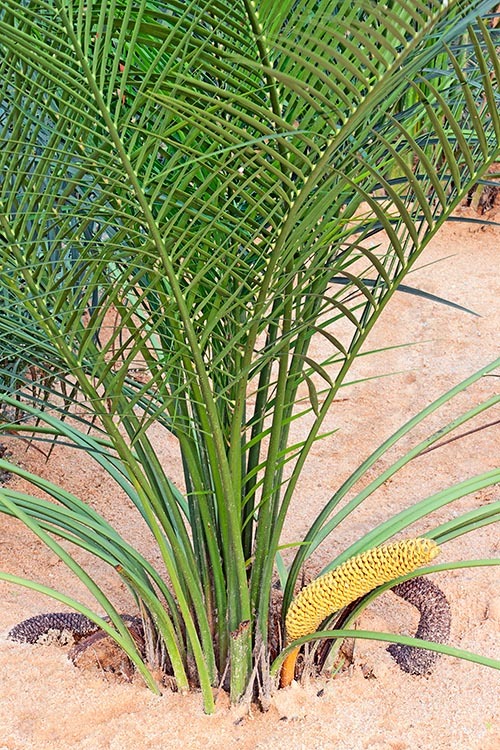 Passing through, for instance, the collection of the Cycads, for each species there is an entire line of them, and this a fast way for appreciating the various growth stages and comparing the cones of the two sexes. This section, almost complete, is the pride of Nong Nooch. In an area closed to the public, we review hundreds of plants coming from tropical gardens of the whole world, but especially plants collected in loco by Anders. We pass from wonder to wonder and the growing leaves often show, at first glance, a distant relationship with the tree ferns. They are all prehistoric plants, living fossils. For a botanist it’s somewhat like for a zoologist meeting herds of living dinosaurs. They stand in open air or shaded, depending on the season, protected by a supporting metallic structure. The ovules are carried by the most unlikely structures and I discover the Zamia lindenii about which Anders has written a text for the Biodiversity Encyclopaedia which we are preparing in the net. He would like to write a book about the Zamias but does not have even time to breathe. Proceeding, we pass the section of the rare palms, never seen species and odd hybrids with bicolourous, green and yellow, leaves. Some of them are much tall and hole the protections against the sun, others are only a few centimetres tall, like the Rhapis which have several species and varieties, created even in loco. I discover the Arenga hookeriana, the Johannesteijsmannia lanceolata, the Licuala peltata, the Kerriodoxa elegans, the Iguanura wallichiana , the Oenocarpus mapora, the Pinanga adangensis and various species about which we have already treated in some texts. A pretty Licuala mattanensis var tigrina attracts the attention because of its unusual spotted leaves. Proceeding, always in this area closed to the public, there is a huge section dedicated to the Heliconia. hybrids. Spectacular species, with inflorescences having showy colours, even more than one metre long, hanging or pointed towards the sky. These are plants native to central-southern America, which, here, may wonderfully grow. As the name of the most common species suggests, the Heliconia psittacorum, lead often to think to the parrots due to their shape and colours. Then, after a sunny zone rich of and Adenium, Croton, Sansevieria various local seedlings, we enter another shaded structure with a rich collection of Costaceae which bloom in summer, after the rains. Incredible cone-shaped flowers, red yellow, orange, often still to be determined. Nearby, I see several Marantaceae, very well known indoor plants, such as the Calathea or the Maranta, but which, here, may be admired often in flower, like in the wild, at the top of their splendour. Also the Cordyline, with large leaves having fanciful colours, have here a collection. 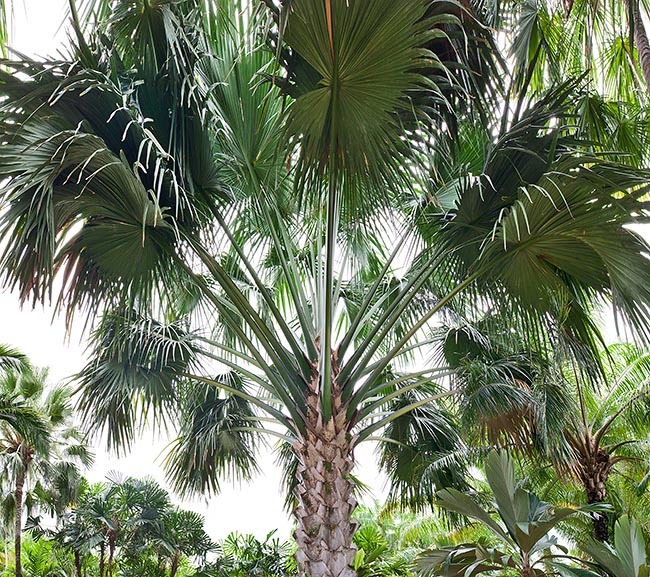 Leaving the restricted area we meet an unusual hybrid palm with stubbles in the upper part of the trunk curved upwards and similar to halberds and we enter the avenue of the climbing plants, exotic plants, mostly unknown in Europe, having the oddest shapes. There is also an avenue dedicated to the Plumeria, with infinity of hybrids blooming in April. But, everywhere, the palms act as masters. 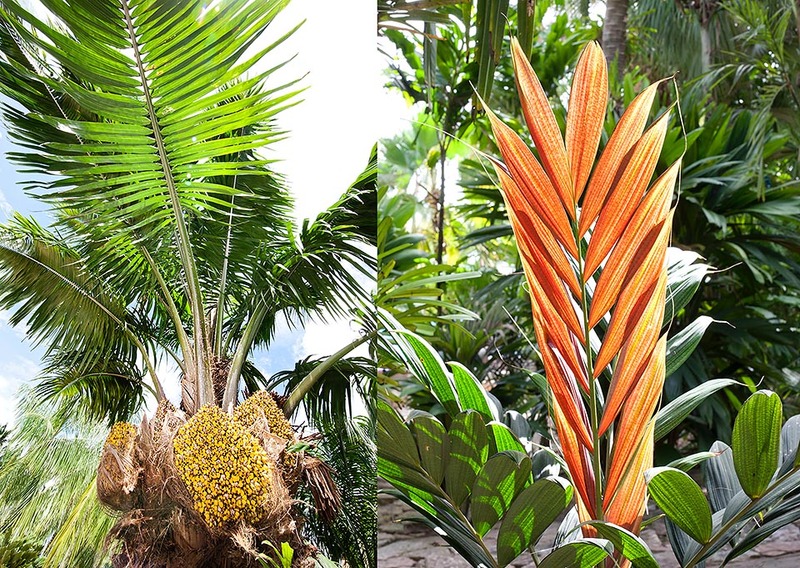 A big Corypha lecomtei, before passing away, shows an impressing inflorescence and more photos, merged at the computer, are needed for giving an idea of a huge Corypha umbraculifera. The palms do have a privileged zone of alleys and small alleys at the top of the garden: at each turn, we discover thickets and wonders. But, above all, quite often, we can look into the eyes, and observe, flowers and fruits at their height, as there are kilometres of metal gangways, interconnected, which follow them like serpents. In front of the main restaurant, we get on a 6 floors structure for touching the top of a huge tree of Dipterocarpus alatus and for having a complete overall view of the garden. There is no lift and we have to walk up, step by step, under the tropical sun, and, to give an example, with a profound sense of humour, Mr. Kampon has placed, along the way, some huge, climbing, ants. They are very much appreciated by the tourists, and they rise on their back for getting photographed. They are mainly Koreans, Chinese, Japanese, Taiwanese, Indians and Vietnamese. Very few Europeans, but Russians, who, during the last times, have invaded Thailand. They come in a day, on big buses, and by the evening, if there are no conventions or weddings, the garden is desert, reserved to the staff and to the botanists in charge. When Mr. Kampon has begun planting trees, tells me Anders, he chose them after their beauty, without worrying about their name. And even f now there are 3000 labelled species, we are not capable to determine many others and we sale them to the wholesalers with their Thai name. The garden is full of many labels showing “sp.“, we hardly know the name of the genus, but we cannot go further ahead. The passing experts often tell us that they have never seen this plant before, and this is true: the garden is full of plants still to be described, waiting for a name. The biggest difference with the other botanical gardens, Anders goes on, stays in the fact that here the various botanical families are not well represented: we have specialized only on few groups of plants; but on these ones we are an important reference point. 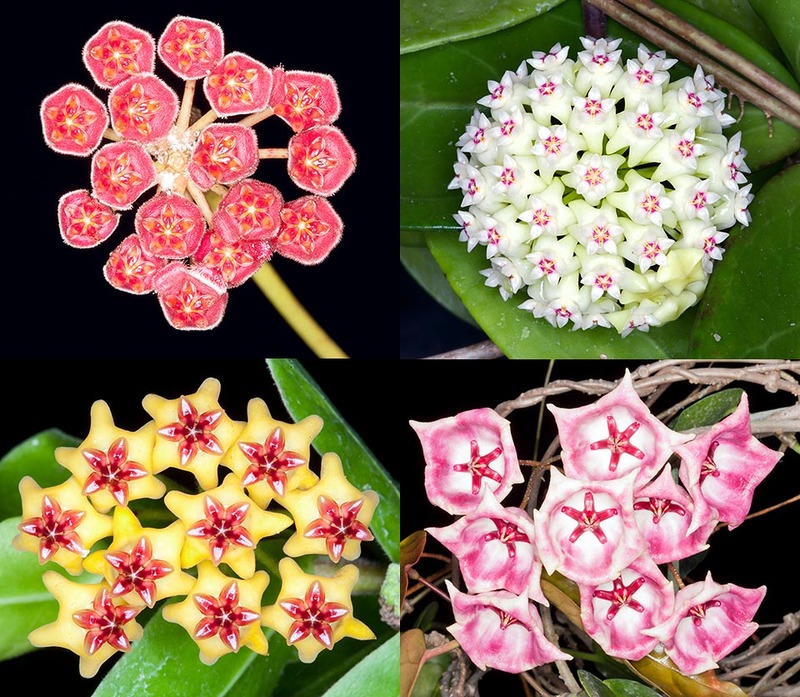 So, apart the palms and the Cycadaceae, we have, for instance, 300 different species of the famous “waxflowers”, the Hoya. I go through, with Anders, innumerable rows in a sort of greenhouse protecting them from the sun: some hang from the suspended baskets and others, always in pot, are lined up, like soldiers, on the ground. 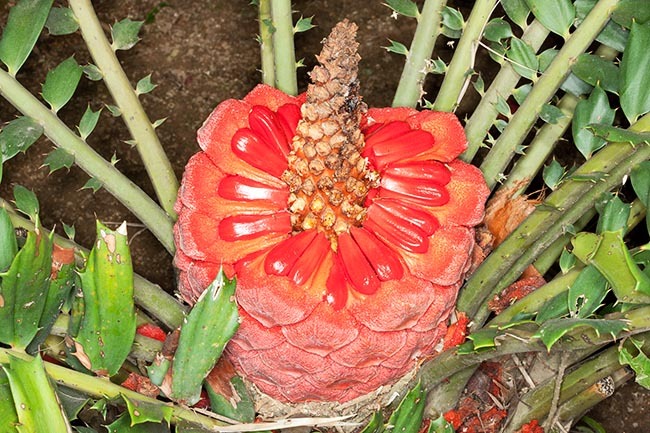 It is a small zone of the immense area of protected cultivation destined to the bromeliads: they are utilized for decorating the garden and for the industrial sale. An impressive quantity to fade our horticulturists. On the sides, in the open, a stretch of water containers in cement, less than a metre broad, for the production of the tropical lilies. They come out from the water. There are some pink ones, but it’s the blue ones which attract the attention: an intense colour, almost fluorescent, often in elegant contrast with the yellow centre. 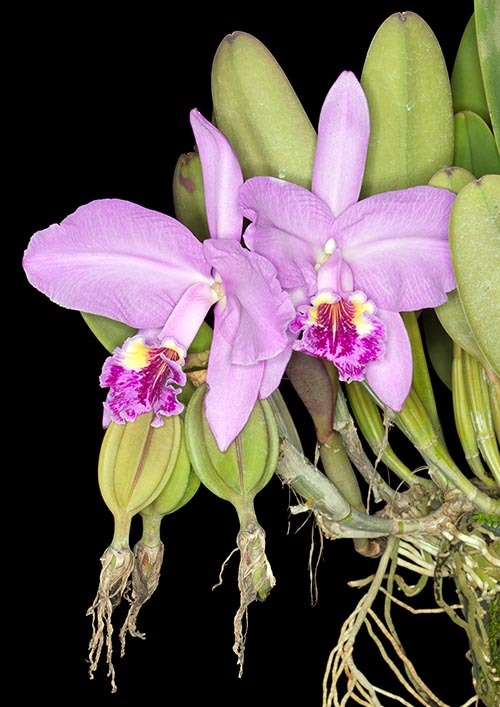 Further on, an analogous covered structure hosts hundreds of orchids, botanical, often rare, but especially hybrids for the decoration of the spectacular “Orchid House” of the garden being renewed every day. 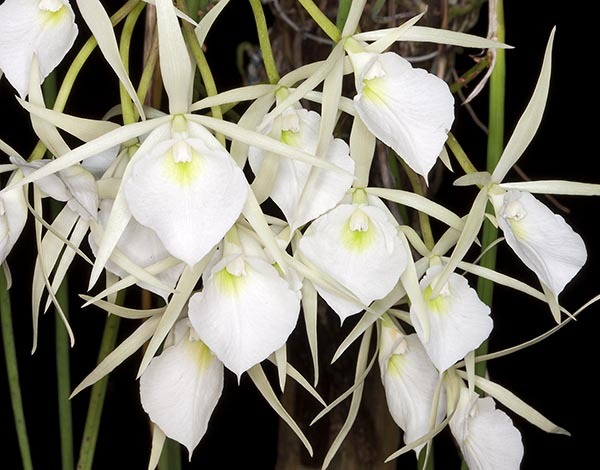 They take off the withered pots and replace them, in order that the Dendrobium, the Vanda and the Cattleya are always at most, the whole year round, for the tourists’ joy. In addition to the French garden, pride of the park, and to the Stonehenge Garden, there is a European Garden with statues and jets of water, a Succulents Garden, with few cacti under a canopy, which resist to the humid climate of Thailand and a rich collection of hybrids and cultivars of Euphorbia milii. 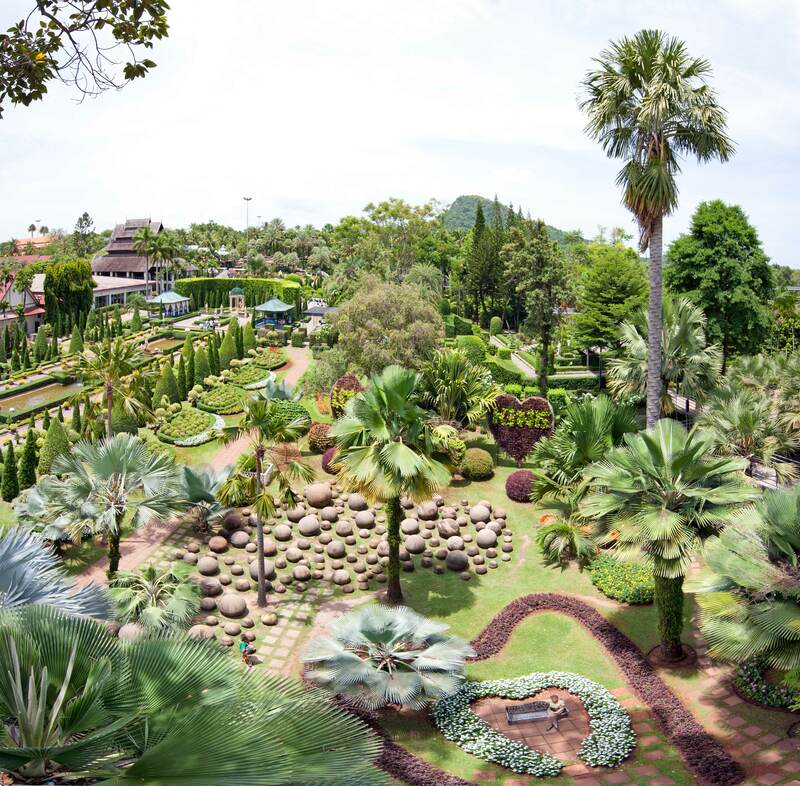 There is also a Garden of the hybrids of Canna, with countless varieties often created in Nong Nooch, and a spectacular Bromeliads Garden, the most popular amongst the tourists, formed by thousands of hidden pots. Finally, they have created a Garden of the Biodiversity with plants, at times rare, at times unusual or used in the tropics for their medicinal or alimentary properties. 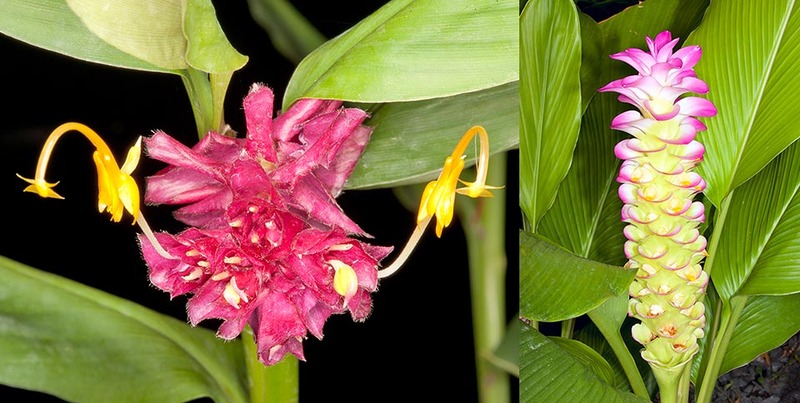 Species which are available only in limited quantities, often received by botanical gardens, which have been put together because they do not enter the specializations till now exposed. If an electrical car for the guests is not available, gangways apart, it is then convenient to move around by bus or, for historical photos, on elephant’s back. At last, there are accommodations, conventions facilities, shows of traditional Thai dances and a small zoo. Even f holding a strong passion for botany, Mr. Kampon Tansacha wants all the visitors to leave happy. He affirms that it s pointless to spend money in advertising, because the best ad is done mouth to ear, and the results are evident, with lines of buses and thousands of daily visitors.